Keys colors frame Henry Flagler’s Overseas Railroad bridge in this panorama from Little Bahia Honda Key. Bahia Honda State Park is about 70 miles down the road on the Overseas Highway from Key Largo. 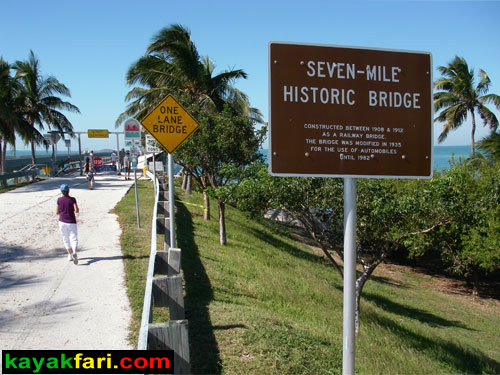 It has the distinction of being on the other side of the world famous Seven Mile Bridge, opposite of Marathon. 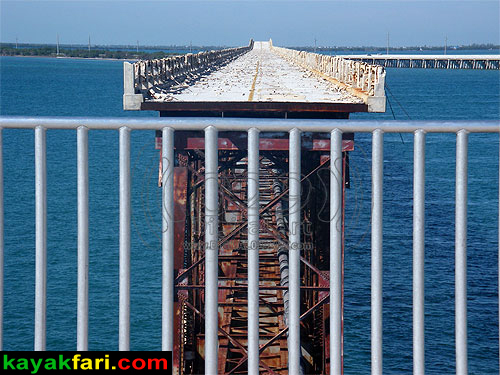 On it’s west side it is connected to the iconic “double decker” old Bahia Honda Bridge. 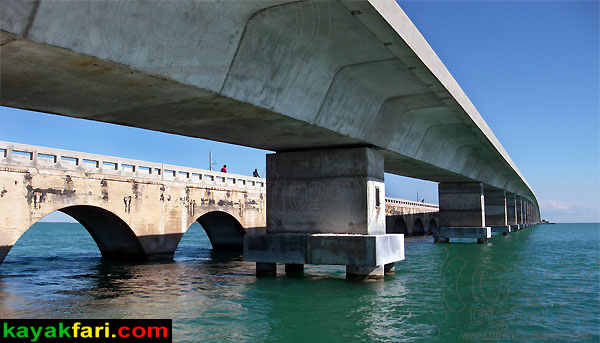 These two bridges form the gateway to the lower Keys, with Bahia Honda Key as the true jewel in the middle! 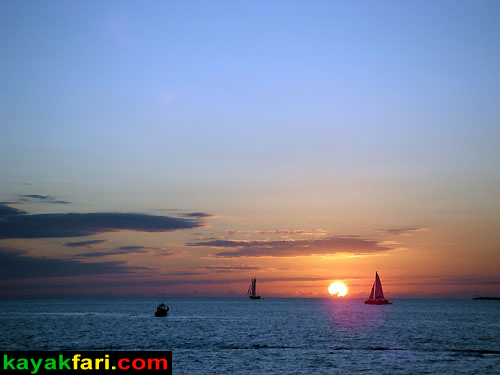 It offers history, recreation, relaxation and beach style camping like nowhere else in the Keys. On approach to the Seven Mile Bridge – 7 miles away from Bahia Honda Key. 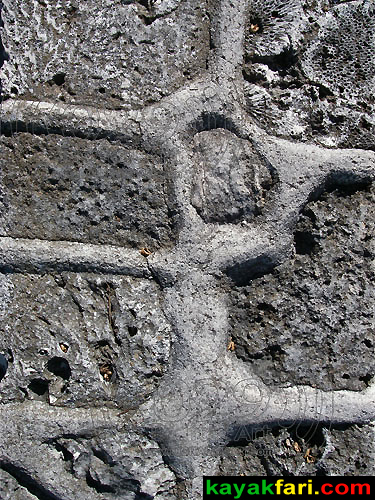 Detail of coral rock and concrete used in the original bridge earthwork in the early 20th century. 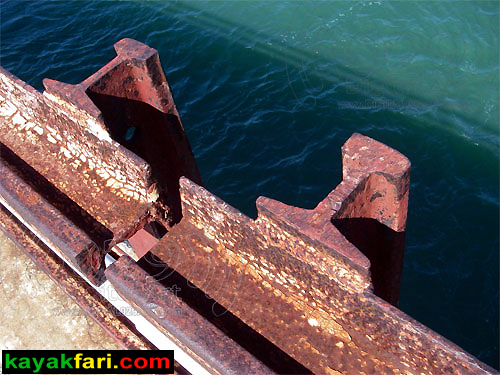 Cut up rail tracks were re-used as railings when hwy US1 was built on top of the original railroad bridge! Original 100 years old bridge section of the Seven Mile Bridge. There is still great local seafood to be had in the Keys as evidenced by all the lobster and crab traps! 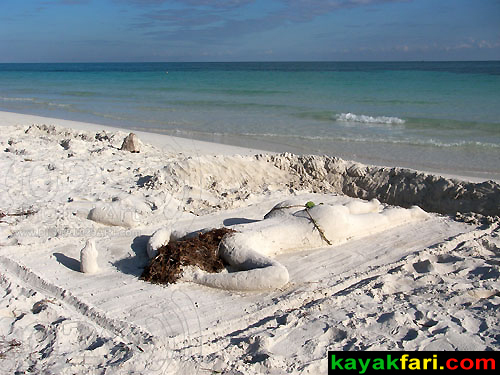 Bahia Honda State Park offers possibly the nicest Florida Keys getaway-camping-island experience. Beautiful sandy beaches, coral reefs teeming with life just offshore, epic sunsets .. the list goes on and on & includes ‘clean and trash-free’, which is a true rarity in South Florida! Bahia Honda Key, was so named for the Bahia Honda, or ‘Deep Bay’ that was the deepest natural water channel found in the Keys preceding the dredging campaigns of the past century. Most of the island is the state park which has some of the nicest beach front camping anywhere! It’s so popular in fact, that most campsites are reserved a year in advance! 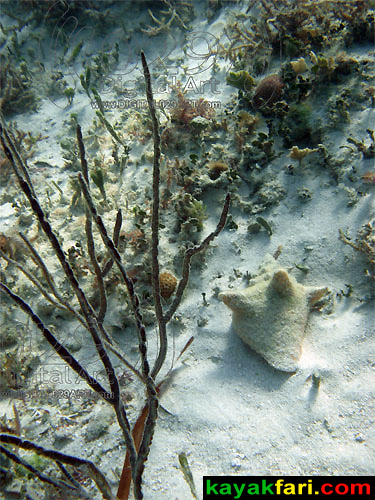 There’s great snorkeling on the ocean side, and a paddling loop around the entire island is only about 6 – 7 miles. 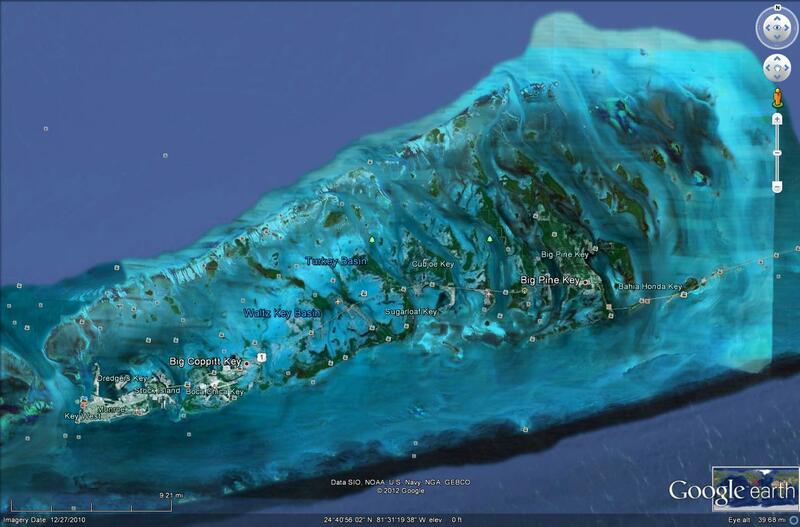 This story will follow a clockwise loop around the island and through a whole day into the night. 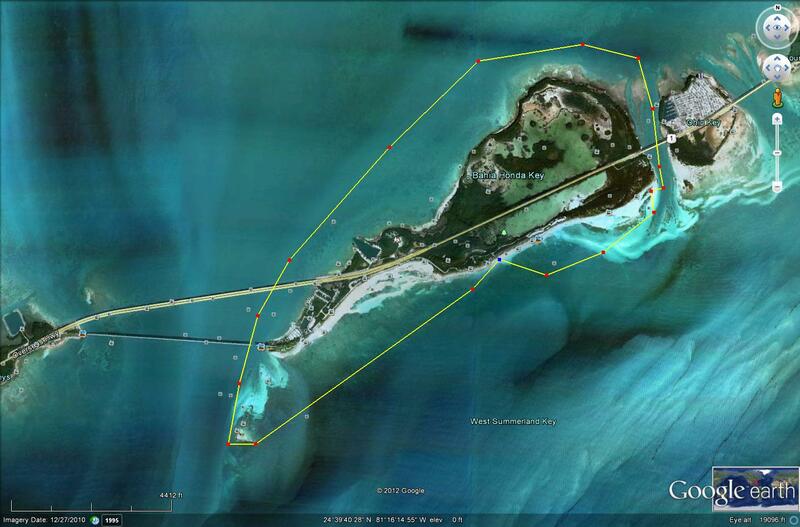 Circumnavigation or rounding Bahia Honda Key totals only about 6 – 7 miles. 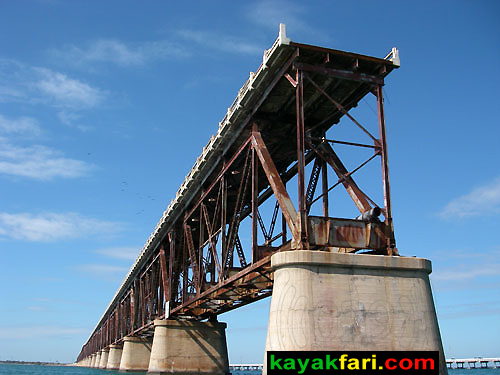 The Bahia Honda Key is also the gateway to adventure in the lower keys! 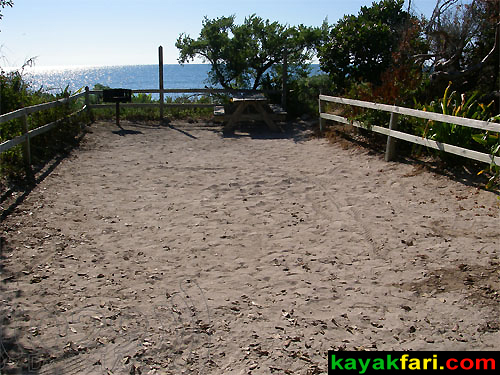 Beach front camping lot at Bahia Honda State Park! Bahia Honda State Park beach on the ocean side. The beautiful sandy beaches merge into coral limestone bedrock as we transition to snorkeling just off the beach at Bahia Honda. 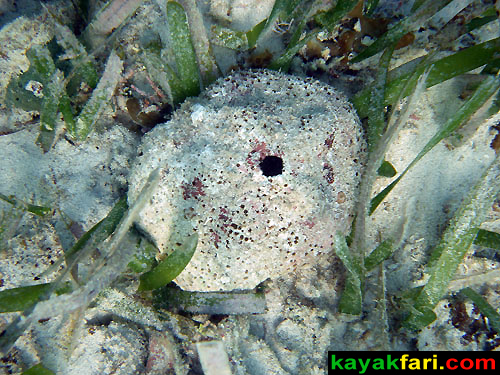 Watch out for stingrays and fire corals! Florida Conch in the sand at Bahia Honda State Park. 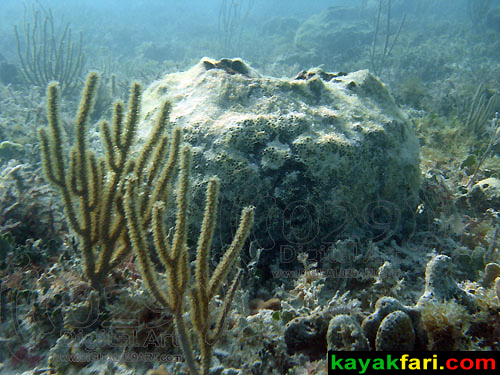 Huge sponge on coral reef just off the beach at Bahia Honda. Large fire coral on reef just off the beach at Bahia Honda. 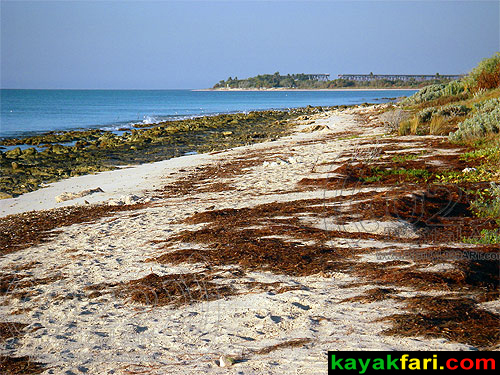 Sea grass beds off Bahia Honda beach. 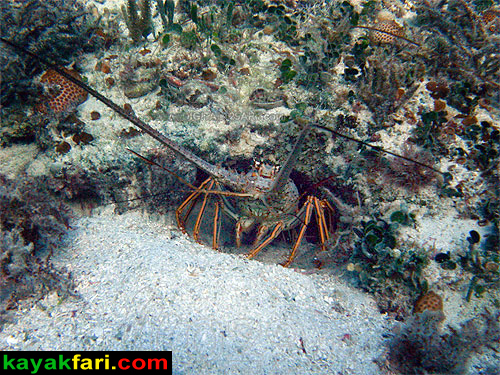 Spiny Lobster in his home on the coral reef at Bahia Honda State Park. 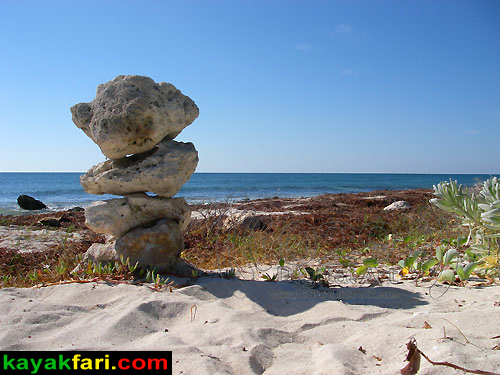 A Bahia Honda rock stack or inuksuk on the beach. What happens in the Keys, stays in the Keys! Back on the beach, a short excursion to Little Bahia Honda Key is a must. This Key is really just a tiny rocky outcrop about half a mile off shore. 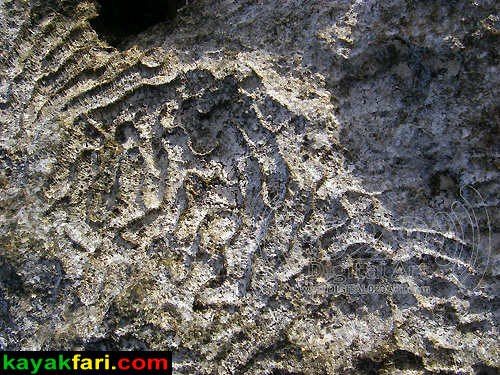 It’s a great example of the geology of the Florida Keys and is near the limit of the extent of the Key Largo Limestone. It’s a great spot to take in panoramic views of the world famous Flagler’s Railroad double-decker Bahia Honda Bridge and the much newer Overseas Highway Seven Mile Bridge which parallels it. Little Bahia Honda Key is just a big rock as seen from the Overseas Highway! 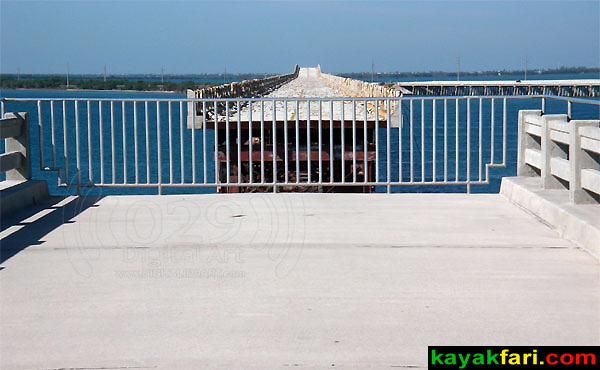 Panorama of original double-decker Flagler’s railroad bridge from Little Bahia Honda Key. 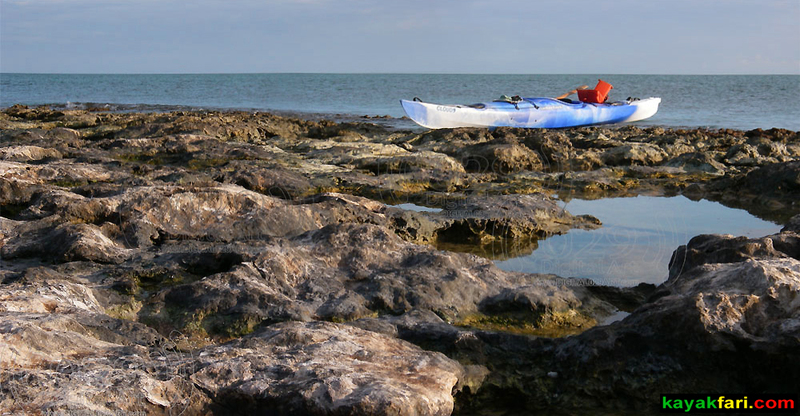 Kayak on Little Bahia Honda Key – Cloud 9 and the tide pools. Keys colors frame Henry Flagler’s old Overseas Railroad bridge in this panorama from Little Bahia Honda Key. My kayak fits right in with the blue-green world colors of Florida’s Keys! Kayaking through “Bahia Honda” .. literally! The natural deep water channel that is Bahia Honda’s namesake can move a lot of water between the Bay and ocean sides. It’s good to be prepared ahead and know the day’s tide cycles and general area forecast. 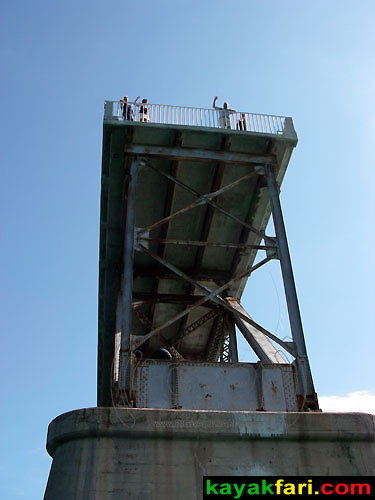 Waving at tourists from my kayak under old Bahia Honda rail bridge section. Artist’s sketch of the original Overseas Railroad Bahia Honda bridge from a similar perspective in the 1910s. A hundred years ago this bridge was an engineering triumph. For the first time, one could ride on a train all the way to Key West. After the intense, infamous and tragic Labor Day hurricane of 1935 destroyed portions of the rail line, it was never rebuilt as such. Instead the State of Florida acquired the right of way and converted this bridge to US Hwy 1 by paving a roadway over the top! I remember riding over it when I was a kid and it was a very narrow and sketchy experience! It served as the main road until the new four lane bridge opened in 1982. 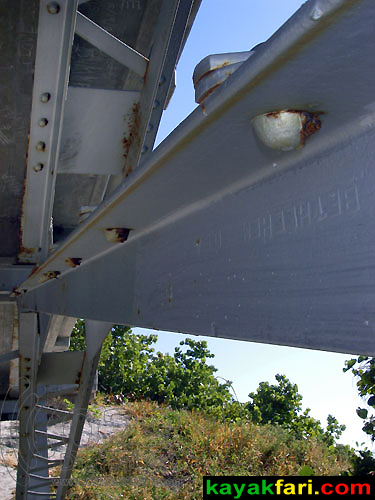 Quality Bethlehem USA steel has stood the test of time on this bridge! The Overseas Highway is born. Section of original ramp leading up to Bahia Honda Rail Bridge. The original 100 year old double-decker rail bridge has been sectioned off for a long time. New highway Overseas Highway US1 is on the right. Going over this stretch on a train must have been quite an experience! I remember driving on top when I was a kid and it was very narrow and sketchy! Driving on top of the Bahia Honda double decker bridge circa 1955! Eerie looking derelict old highway built on top of Flagler’s rail bridge. 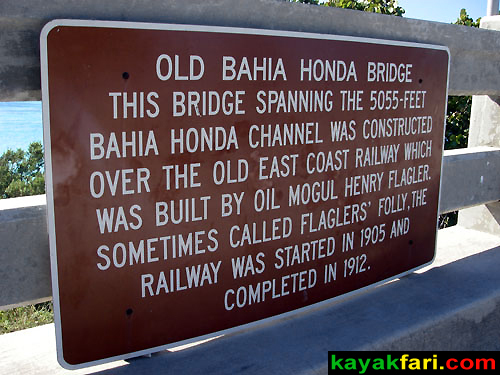 Beautiful view of famous double-decker Flagler’s bridge at Bahia Honda. The whole unsectioned Bahia Honda bridge in 1954. Bahia Honda State Park lagoon on the Bay side. On the Bay side the water is pretty shallow as you cruise around the mangrove heads. Although kayaking here is all about an island-time, relaxing, laid-back kinda vibe, you should not lean back when you paddle. Leaning forward into your stroke and using your abs means you will exert less overall effort and yet have a faster and more efficient glide! This is actually important even when you’re relaxing. Paddling past a lobster boat on the Bay side of Bahia Honda. There’s a salt water lagoon in the interior of Bahia Honda Key where birds congregate. Check with the park, it may or may not be accessible depending on the tide situation and time of year. If you don’t have or didn’t bring your own boat, you can also rent from the concessionaire at the park. The crossing from the Bay to the ocean on the northeast corner of the island is a great place to see both the old and new Seven Mile Bridges side by side. Watch out for fisher folk and their lines when going under the old bridge! 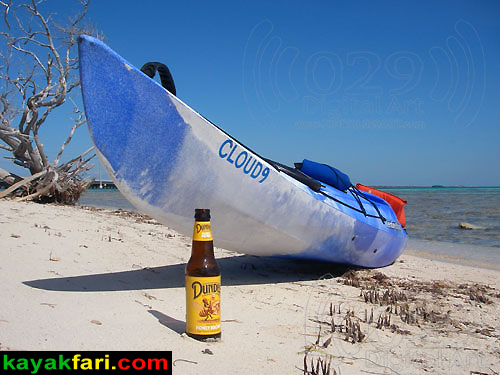 Cloud 9 is what kayaking feels like at Bahia Honda! A 180 panoramic from the east side of Bahia Honda Key. 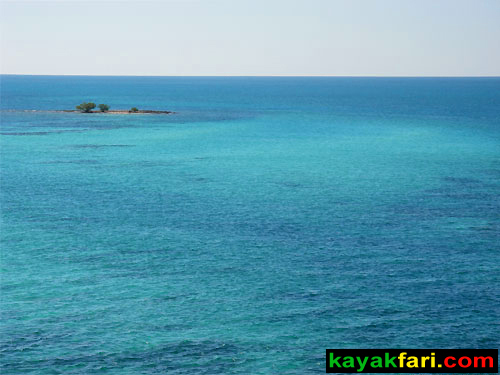 Snorkeling and kayaking on the east tip of the key. Fun in the sun at Bahia Honda Key beach. You never know what you’ll see next in the Keys! Classic Keys colors & hues at sunset on Bahia Honda beach. In the darkness at Bahia Honda Beach. Note the strong light pollution glow from Marathon to the east! If you get a chance, try paddling around a bit at night .. it’s gorgeous out there! CLICK for crazy 360 x 2 figure8 interactive panorama! 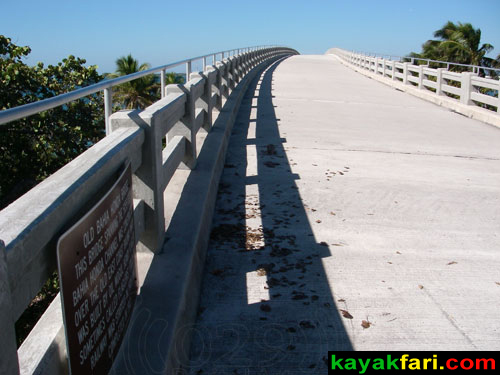 Aside from the circumnavigation of Bahia Honda Key, other alternate kayak trips might include the Money Keys or Molasses Key on the ocean side. 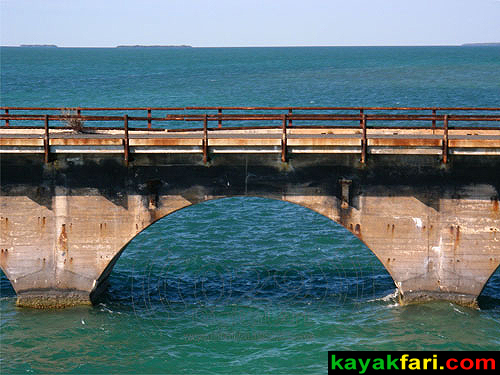 More ambitious paddlers could try a ride out to Pigeon Key or Knight Key (Marathon) along the entire length of the Seven Mile Bridge. This is a distance of 15 – 20 miles round trip from Bahia Honda beach and a very scenic, albeit somewhat monotonous paddle. Be prepared to deal with powerboat traffic as this is also a very popular boating area! To learn more about Florida Bay and the Keys, I can recommend this informative and beautifully done book. There is a wealth of information inside along with incredible images by internationally recognized and top local Everglades photographers. If you like Florida Bay and the Keys, you will LOVE this book!